Learning how to make a topiary is a time consuming hobby. In the following interview with Deborah Shelton you will learn what topiary actually is as well as the best plants to use for this type of project. Can you explain how to make a topiary? Take two or three young trees with trunks approximately one quarter inch in diameter. *Now braid or weave them together. Let them grow trimming new growth into the shape at the top that you prefer, such as a ball or pyramid. You can also let the top grow naturally for a free-form look using olive trees, berry trees, citrus or fragrant herbs. Train your plants to climb on a trellis while they are young. Attach string to the plants and make them climb the shape of the topiary form that you desire. A topiary trellis structure should be located on the north side of your flowers so the plants will not be shadowed. What are the best plants to use in the topiary? The Black-eyed Susan is one of my favorites. The vine has a green leaf with a blanket of scattered, golden yellow flowers. It is a fast-growing annual, and in the south it can be treated as a perennial. If you are one that doesn't have a lot of time you will love this flower. Its easy to grow lifestyle tolerates hardship conditions. Morning Glory is one of the fastest growing annual vines. Soak seeds in water two days before planting or rub seeds with sandpaper. Plant them one inch apart after danger of frost. It likes full sun. Passion-flower and climbing roses are among the most popular today. The passion flower requires no special treatment other than pruning. Roses are like people; they need lots of care and like their space. Give them plenty of light and air. Allow for horizontal training which results in a better bloom. Vines such as the English ivy climb clingingly with aerial roots. The tendrils on grapevines wrap around anything they happen to contact. Other vines, such as Japanese creeper, stick adhesive disks to the walls. I love the Star jasmine which bears fragrant, white, star-shaped flowers in June and July. You can enjoy its green vine year round. It likes partial shade and moisture. Tip: Pinch back when plants are young. How do you care for topiary arrangements? DS: Usually nurseries will provide special industry care sheets. Most topiaries need once a month fertilizer. Use fertilizer specific for the type of plant chosen. A nursery trick: Use one tablespoon of household ammonia to one gallon of water every two weeks for fern-type plants with daily watering. Keep the topiary trimmed to maintain shape. Topiaries need consistent watering to prevent leaves from shedding and to produce heartier flowering. To achieve the healthiest look, it is important to assure that the root ball is properly saturated. 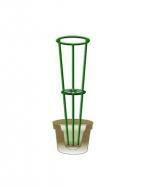 It has been suggested that the plant's pot be submerged in one to two inches of water at least twice a week. To prevent insects, dip or spray the plant with soapy water using one tablespoon of soap to one gallon of water and repeating every two weeks as needed. Where did topiaries come from? DS: Topiary actually means to give shape or to form something. So when we clip or train plants, vines or trees to grow into a particular shape it becomes a topiary. 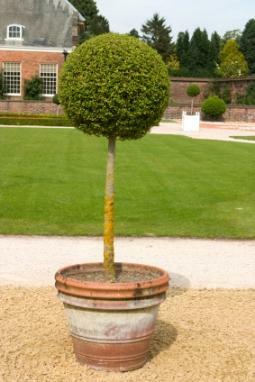 The word "topiary" is actually derived from the word topiarus which is Latin for a landscape gardener. The description "topiary" has been around for 2000 years. The wealthy families of ancient Greeks and early Romans were the most likely to have them. Topiaries have evolved cyclically throughout history. In affluent times they flourish, yet in times of famine or war they tend to decline. The Victorian era gave new attention to the topiary and today we enjoy topiaries indoors in all rooms of the home as designer pieces. Topiaries are used as centerpieces for holidays, weddings and special occasions. Topiaries are seen outdoors at front doorways of homes to accentuate the entry and welcome friends and family. Topiaries are found on patios and in the landscape and are a gardener's proud masterpiece. They are a special gift to give at any time for any occasion! Making a topiary requires patience and a little bit of dedication, but with a steady and consistent effort, anyone can adorn their yard with a beautiful topiary. LoveToKnow would like to thank Deborah for sharing her expertise and making the art of the topiary seem almost easy.